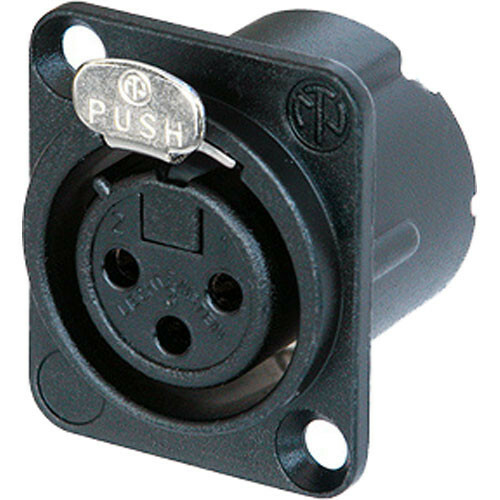 The Neutrik NC3FDLXBAG is a black 3-Pin XLR receptacle with silver contacts for analog audio tranmission. The connector has RF protection and 3 shield silver contacts, ensuring clean signals every time. The NC3FDLXBAG works well with Neutrik's EMC XLR cable connector. Box Dimensions (LxWxH) 2.9 x 2.5 x 2.15"
NC3FDLXBAG 3-Pin XLR Female Receptacle is rated 5.0 out of 5 by 2. Rated 5 out of 5 by DJNN from Better Than OEM These connector are sturdier than the OEM connectors in our audio snake. They also operate smoother. Rated 5 out of 5 by John Bonnell from Quality connector One of the best.